Momma and daddy had to work the barn hunt event in the barn all day. They hid the rat in a tube and two empty tubes in all the haybales in one of the horse stalls. Every doggy that signed up (about 50) got to come in and be timed to try to find it. Most didn’t this time. 4 dogs in my category did. But I did it the fastest *S*. Plus I got a really big ribbon for being the judges choice !!! Momma was disappointed cuz she doesn’t get to “play” me. Says it wouldn’t be fair. So “Uncle Dale” releases me and calls the “stop time” command when he thinks I found it. It’s easy to know when I find it though, I really go nutso. Other doggies are just really not that interested but I am........I live for “rats”. Ok, the bad part of the day is... I only get to play once. And I got to listen to momma playing with all the other doggies. I don’t like sharing momma, OR sharing my rat. I know, I know, it’s not really my rat, but a guy can hope can’t he??? 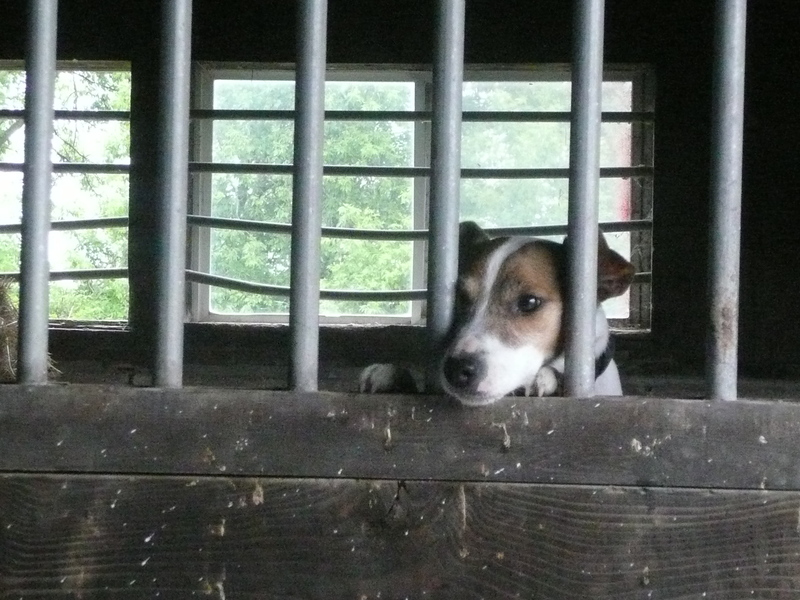 So I got locked in the horsestall across from the one with the rat. I ask you now, do I look like a horse??? It was humiliating I tell ya, humiliating. I just wanted to play with the rat. But we also got to do the GoToGround competition. I had to run and go into a underground tunnel. At the end of the tunnel is the judge with a rat in a cage. I tried to cheat. I bypassed the tunnel and went straight to the judge. He wouldn’t let me near that rat grrrrrrrrrrr, so I ran back and ran into the tunnel and found the rat. 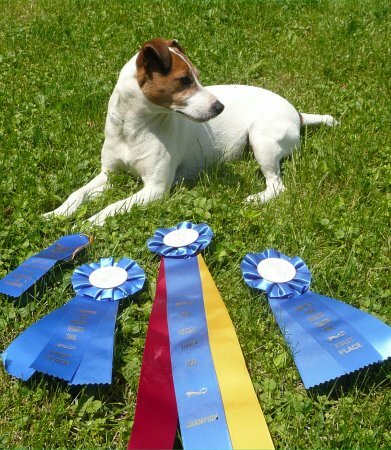 I didn’t get the fastest time blue ribbon but I got a passing score blue ribbon *S*. One other event we did was Trailing and locating. There was a path made in the growing hay field. Me and momma had to run and follow the scent to find the rat. We took off running,I was doing great when momma turned and I didn’t.. hmmmm. Pretty soon, I lost the scent. grrrrr but momma said “come, looky here”. I did. Got the scent and “flew” the rest of the way to the rat. my last event got cancelled cuz the motor broke down. I was so disappointed. We waited a hour in line for a turn then didn’t get one. But momma says that stuff happens. all in all it was a great day!! Can we do it again tommorrow?????? ?